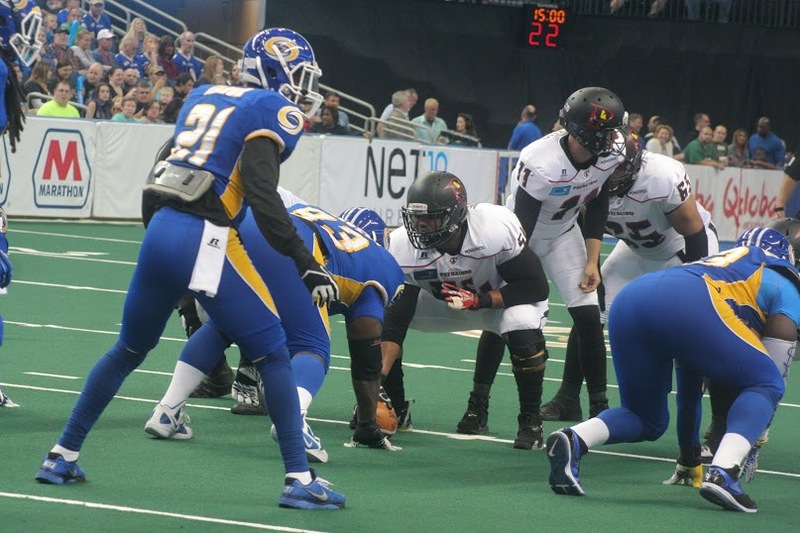 One play with 45 seconds left turned a potential victory and 3-0 start for the Tampa Bay Storm into a frustrating loss to a bitter rival in the first installment of the 2014 Battle of I-4 with the Orlando Predators. After recovering the on-side attempt from the Orlando Predators emergency kicker Brian Jackson, all the storm had to do was run the remaining minute off the clock and a 52-48 victory would be theirs. In sports you sometimes can over-think or out-smart yourself — that is what may have happened when Tampa Bay’s first year Head Coach Lawrence Samuels decided to call a sneak with quarterback Randy Hippeard. What looked to be a simple run behind the guard turned into disaster when Hippeard fumbled the ball and it was recovered by Orlando Predator defensive lineman Mark Robinson. Orlando proceeded to drive down the field with a six play 40 yard drive that was capped off by a Gregg Carr three yard touchdown to steal the game in front of a crowd of 10,896 in the Tampa Bay Times Forum. If not for the fumble Hippeard, who is in his first season as the full-time starter for the Storm, had a productive game going 17-of-32 for 288 yards and seven touchdowns. Five of those touchdowns went to former USF standout receiver Amarri Jackson, who totaled six receptions for 83 yards. Defensively the Storm were led by defensive back Chris Smith, who single-handily ended two Predators drives by intercepting passes from quarterback Jason Boltus. Smith, a first year player out of Northern Illinois, also had seven tackles on the night. And while it seemed as if the Storm had full control of the game heading into the fourth quater with a 39-28 lead, the Predators unleashed a scoring assault that saw them put 28 points on the board and eventually take the lead. Boltus, a second year quarterback from Hartwick, fished the game 28-of-44 for 337 yards and six touchdowns. And just like his quarterback counterpart, Boltus made sure to spread the yards and touchdowns around. Carr, the former Florida State Seminole receiver, led Orlando with 10 catches for 77 yards and two touchdowns — none better than the one-handed 14 yard touchdown catch to end the first half. Not to be outdone Kendall Thompkins had seven catches for 129 yards and Khalil Paden had eight catches for 83 yards. In addition to the costly fumble, the Storm missed four extra point attempts and had three penalties for 15 yards.